Nylon folding flyer in matching colour pouch. 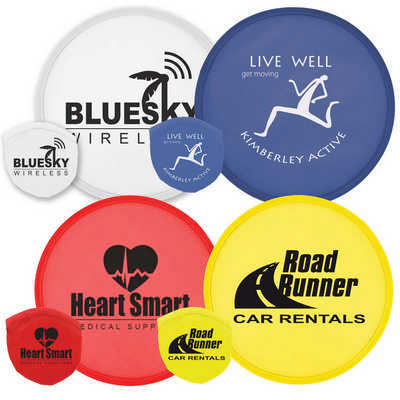 Colours - Blue, Red, White, Yellow Size - Flyer: 250mm Diameter, Pouch: 95mmL x 95mmH Decoration Area(s) - Screen Print Flyer Only (Max 1 colour print) : Front - Circle 180mm Diameter; Screen Print Flyer and Pouch (Max 1 colour print) : Flyer - Circle 180mm Diameter, Pouch - Circle 50mm Diameter. Price includes : 1 Col 1 Pos Print on Flyer. Setup is included.